(Cleveland, OH) - New name. Same liquid gold. Chillwave Double IPA is set to crash into our distribution markets in 4-Packs and Draft the week of February 24. Get ready to reunite with the "Wild Child" in our Exceptional Family of Beers. Chillwave Double IPA is hop-forward with a balanced blend of Mosaic and Nugget hops, and a flash of honey malt. We named our double IPA in honor of the Great Lakes' surfers, who brave chilly waters and extreme conditions to get their thrills. To learn more about our February Seasonal, click here. Chillwave Double IPA will debut exclusively at GLBC's Chillwave Double IPA Pre-Release Party on February 17. The beer will only be available at this ticketed event until its actual release. 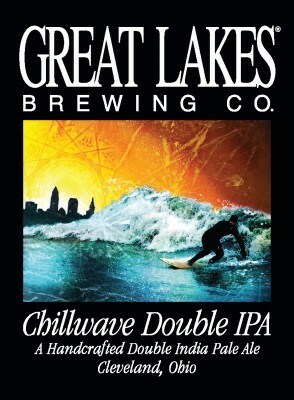 Chillwave Double IPA will be tapped exclusively in the GLBC Brewpub on Thursday, February 20 at 11:30 AM. The beer will only be available on tap (no bottles). Chillwave Double IPA bottle sales will begin in the GLBC Gift Shop on Friday, February 21 at 5PM. The following week, look for Chillwave Double IPA 4-Packs, Cases, and Draft in GLBC's distribution markets!